Your Resurrection will be greater than Saint Lazarus, not only of the body but your spirit, your dignity, your namesake and very life – When God began to Create He saw in advance each soul, even those who would throw themselves into Hell. HOLY SPIRIT: “I know you do not as yet understand as to why events have occurred as they have, but you will. However, it is like this: when God Creates an event or foretells an event to come He sees it in a moment of time as the event to happen, even in all Prophetic moments. When souls do not react upon the given Grace at that moment the Prophetic Word then changes due to man’s free will act. But this does not change the ultimate Plan of God as in your case, because you will be set free and your resurrection will be far greater than Saint Lazarus because his resurrection was only the body – yours will be your spirit, your dignity, your namesake, your very life, as all that God has said about you will be fulfilled, and those who claim that they did not know what they were doing, this is not so; because they saw, they heard, they experienced all the miracles that I gave through you by your love, mercy, forgiveness, trust and faithfulness. And because of their incredulity they will, or already have, been punished by God according to the incredulity they performed. I was preaching to a crowd of some ten thousand – and more; there were rolling hills and plains, and I was preaching with such power, yet I was only going to introduce someone, but the power that came out of my mouth was with such eloquence – even I was astounded at what came out of my mouth. The people were captivated at what I said to them – I was speaking as if I was bouncing off the Flames of God’s Spirit at Pentecost. Suddenly the Heavens opened, the clouds parted and the Angels could be seen and heard singing. Suddenly the Holy Trinity came over me in a Triangle of Light and I began to levitate. I went into this Light within the Trinity and as this Triangle raised upwards, Our Lady Appeared above the crowd. The Triangle with me went into Our Lady’s Immaculate Heart and all saw this. Then a boom sounded and little Flames of Fire appeared over all heads as I gazed at the people who were sitting on the podium from where I was preaching or came from. I saw familiar many faces. It was then I woke up to the Voice of God saying this is how it will be seen. In his treatise on Prophecy, Saint Thomas writes in the Summa Theologica (Q. 171 article 6 and Q. 174, article 1) that nothing false can come under prophecy. And then he explains about secondary causes (he uses the word “contingent” meaning a thing is dependent on other causes for its outcome). The certitude of Divine foreknowledge does not exclude the contingency of future singular events, because that knowledge regards the future as present and already determined to one thing. 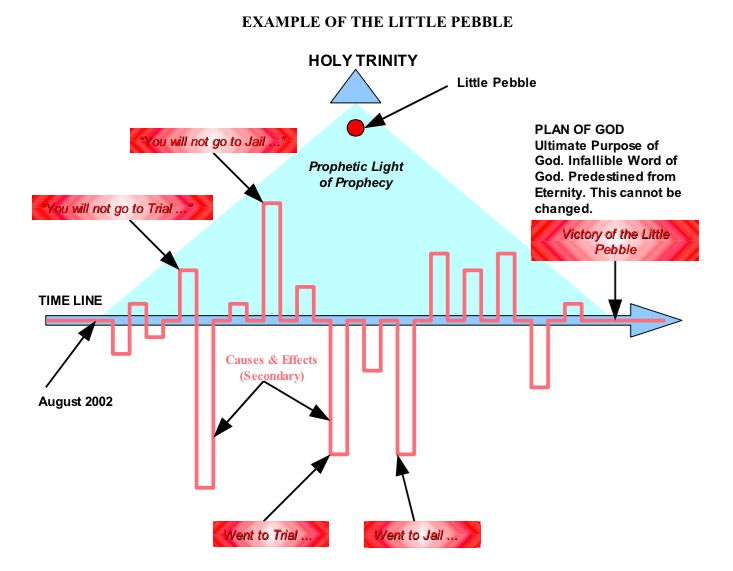 So, prophecy does not exclude (by its unchangeable truth) the contingency of future things. So, by that Saint Thomas means that secondary causes might go either way – depending on the free choice of other people or situations, etc. However, this does not undermine the unchangeable truth of God’s Plan – its outcome, because this is predestined by God Himself to be a certain outcome. Saint Thomas goes on to explain further that – although future contingencies are determined to one thing (eg, a prophecy says: “A will not happen” … B will not happen”) yet considered in their causes (secondary) they are not so determined, but they can happen otherwise (eg, where in actual fact: “A does happen … B does happen”). 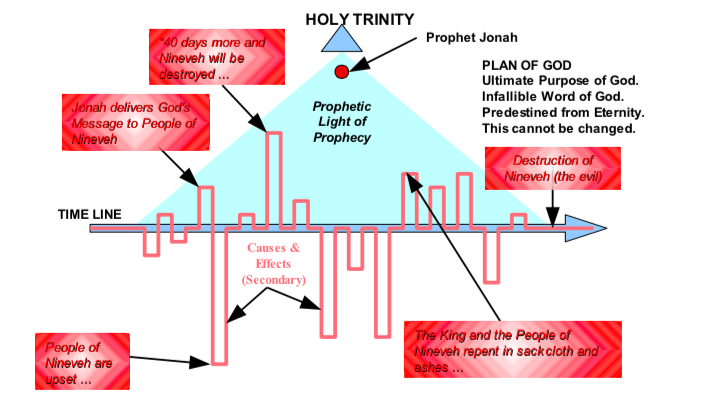 He then explains how prophecy does not cover a falsehood, because he says that the meaning of prophecy is that inferior (secondary) causes – whether natural causes or human acts – are so disposed as to lead to such a result. But nothing can stop the Plan of God to reach it’s end or purpose. 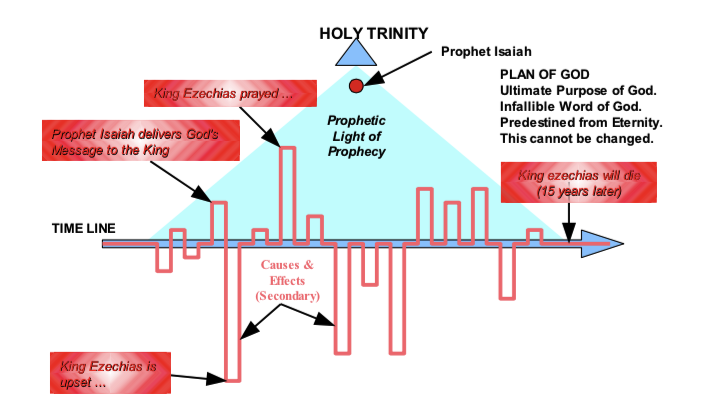 However, he gives a better explanation when he adds: The foreknowledge that is acquired concerning future events from Divine Revelation, according to prophetic Grace is altogether certain. God foreknows future events infallibly as they are in themselves. Prophetic knowledge of future events is given to man in the same way – with perfect certitude, even though some future events are contingent. In other words, he is saying that God has infallible knowledge of what will happen and God gives perfect certitude to His Prophet about it, but he says that things might turn out differently depending on other secondary causes (perhaps, like a Doctor who makes a faulty diagnosis of a patient’s pathology and then failed to take certain actions resulting in the opposite happening). 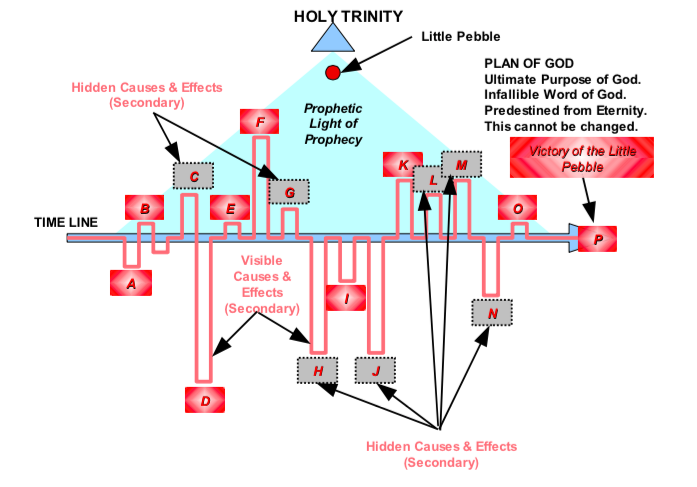 Saint Thomas explains further, that if these secondary causes are obstructed from achieving their effects, then nothing prevents the prophecy from being modified. Perhaps this is the example of people who willingly fail to do the right thing when they know what they should do; or again, people who fail to take good counsel earlier on – and therefore fail to take a certain right course of action, thus an obstruction is caused — by their omission – by their human acts – hindering the fulfilment of that prophetic revelation. The example that Saint Thomas gives is when the Prophet Isaiah told the sick King Ezechias: “Take order with your house, because you are going to die, not live”. But he was restored to health by God a short moment later after the King made his fervent prayer to God, then God modified the prophecy telling Isaiah to go tell King Ezechias that God was granting him 15 more years to his life. Seemingly, exact opposites. The other example Saint Thomas gives is: Jonah, the Prophet was told to reveal to the People of Nineveh that “after 40 days, Nineveh shall be destroyed”. Yet God did not destroy it. Saint Thomas explains that in these two cases, the prophecy given to the Prophet Isaiah and also to Jonah was concerned with secondary causes. In other words, that Isaiah’s prophecy was according to King Ezechias’ bodily condition – that on the surface of things, he had all the conditions for dying, but when the King prayed so fervently to God – his prayer was heard. So the Plan of God was always the same, that the King would live for 15 more years. In Jonah’s case, the prophecy was given to Jonah according to the merits of its People at that moment. The fact that they all repented, was a secondary cause, that could have gone either way – but in fact they repented. So, God did not carry out the physical destruction of Nineveh. God’s Plan was always the same here too – that the destruction of the evil in Nineveh would happen as foretold to Jonah. I have used another analogy to help explain it further – like the analogy of a puzzle where not all of the puzzle pieces are showing. They are simply not visible to the viewer. These letters are: C, G, H, J, L, M, N, But these letters are very important because they are in the line of causes and effects (eg secondary causes). So the effect “D” happened because of the HIDDEN “C” not “B”. The same for the effect “I” in which there were two HIDDEN effects — “G” and “H”. Also with “K” the HIDDEN effect “J” is really the cause, but it is not visible. So, sometimes God does not reveal the whole picture – He leaves out certain pieces of the puzzle, thus everybody is confused – because they cannot see the HIDDEN pieces of the puzzle. The Little Pebble asked me to include (with this Message) the above little example from the writings of Saint Thomas Aquinas. It explains (hopefully) that what is revealed above in the Message is completely in conformity with the Teachings of the Holy Catholic Church. The diagrams are from me, and are a poor attempt to graphically portray the truth of what he is writing. You can discard them and simply read the text itself. I have paraphrased some parts in order to make it easier to read. +Bishop Malcolm L. Broussard, Jr.